Jimmy Wayne Wilson was born on September 26, 1958 to Joe Elcany Wilson and Hazel Lou (Leonard) Wilson at the Community Hospital in Elk City, Oklahoma. Jimmy went to be with his Lord on Monday January 14, at the age of 60 years. Jimmy resided at home with Joe and Hazel until the age of 8 then moved to Pauls Valley State Institution. He lived in Pauls Valley until his mid 30’s and moved to Sagebrush group in Sayre to spend the second half of his life. He gained a second family during his time there. The last 12 years he was cared for by his “second parents” Robert and Lona Jordan. He gained five siblings at Sagebrush, Martha, Brandi, Kenny, Richard and Donnie. He lived there until September of 2017. After a short illness at Mercy Hospital, he went to live at Elk City Nursing Center until his death. Jimmy found his “third family” at Elk City Nursing home. He was loved by the nurses, aids and all the health care providers that cared for him. To know Jimmy was to love him. Jimmy loved life to the fullest. He loved to drive a boat, ride horses, set on the tractor and ride in the back of a pickup. He loved riding with Nancy in her jeep with the top off. Every trip he took in a motorized vehicle resulted in a trip to the sonic for ice cream and a diet coke. He loved WWE wrestling on TV and setting in the floor lining up his trucks. He participated in the special Olympics. His job for many years was shredding papers at the Sagebrush office. Jimmy had many talents. He loved to rock babies and would always steal Chuck’s hat. He loved his momma dearly and come home and play with is trucks. His favorite hobby was to eat and play the piano. Family will receive friends from 6:00 p.m. to 8:00 p.m., Wednesday, January 16, 2019 at Martin-Dugger Funeral Home, Elk City, Oklahoma. Funeral services will be held at 2:00 p.m., Thursday, January 17, 2019 at the First Baptist Church in Elk City, Oklahoma. Jase Hargrove will officiate and be assisted by Chuck Hargrove. Interment will be at Port Cemetery in Washita County, Oklahoma. Services have been entrusted to the care of Martin-Dugger Funeral Home in Elk City, Oklahoma. 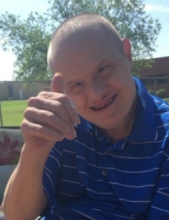 Cherishing his memory include his mother, Hazel Wilson of Elk City. Sister Nancy Hargrove and husband Chuck of Elk City. Sister in Law Carol Wilson of Elk City. Half Sister Debbie Halm and husband Ralph Frederick of Las Vegas, Nevada. Nephew Jase Hargrove and wife Robin, Neice Kasee McArthur and husband Kriston, Neice Heather Sutton and Husband Brandon, Nephew Jon Wilson and wife Jennifer, Nephew Ben Wilson and Wife Wendy, Niece Tammy CanVanDenheuvel, Nephew Chris CanVanDenheuvel and niece Beth Looker. He was preceded in death by his father Joe Wilson, brother Bill Wilson and Best Friend Donnie Thompson. Memorials can be made to the Lincoln Teen Center in care of Martin-Dugger Funeral Home, P.O. Box 707, Elk City, Oklahoma 73648. To send flowers or a remembrance gift to the family of Jimmy Wayne Wilson, please visit our Tribute Store. "Email Address" would like to share the life celebration of Jimmy Wayne Wilson. Click on the "link" to go to share a favorite memory or leave a condolence message for the family.